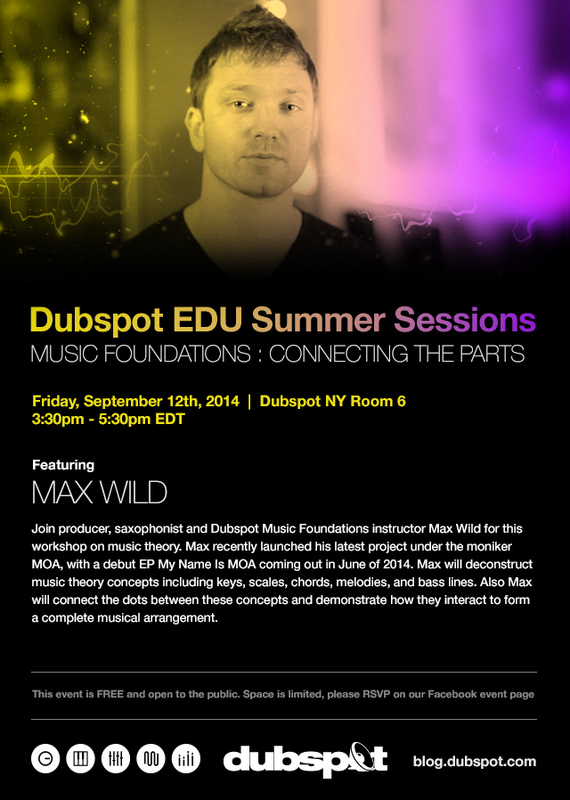 On Friday, September 12th, we continue our series of FREE workshops at our NYC campus with a presentation on music theory with Dubspot Music Foundations instructor Max Wild. Join producer, saxophonist and Dubspot Music Foundations instructor Max Wild for this workshop on music theory. Max recently launched his latest project under the moniker MOA, with a debut EP My Name Is MOA that came out in June of 2014. Max will deconstruct music theory concepts including keys, scales, chords, melodies, and bass lines. Also Max will connect the dots between these concepts and demonstrate how they interact to form a complete musical arrangement. Check out Max’s full-length album, Maverick, due out September 23rd. This event is FREE and open to the public. Space is limited, seating is first come, first serve. Please RSVP on our Facebook event page.